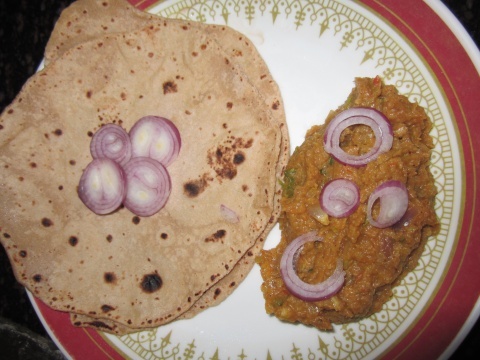 I like paav bhaji since it is rich in nutrition and low in calories. Whenever bread is not available at home, i prefer to have it with chapati or dosa. It is quick and easy to prepare. Boil all the chopped vegetables except onion for 10 mins. Remove from the heat and let it cool. Blend everything except tomato to smooth paste. Blend tomato separately. Heat oil in a pan or kadhai. Tamper mustard seeds. Add onion and ginger-garlic paste. Saute a while and add tomato puree. Add vegetable paste, turmeric powder, red chilli powder, garam masala, paav bhaji masala and salt to taste. Mix all and cook it uncovered for 10 mins. Add water if needed. Garnish with chopped coriander and onion slices. Serve hot with bread or chapati.